Danyel is lucky enough to have grown up in Trinity County, CA. She holds a B.A. in French Literature from Reed College, and a J.D. with a special certificate in Environmental and Natural Resources Law from Lewis & Clark Law School. She has worked in locales as exotic as Austria, France, Kenya and Nebraska and at jobs as varied as caregiver for a pediatric cancer-patient; to Wilderness Patrol Person in the Trinity Alps; to Assistant Attorney General in the Natural Resources Section of the Oregon Department of Justice; to crewmember on the MarchFourth Marchingband twenty-three passenger tour bus. After more than thirteen years away, Danyel returned to Trinity County with her husband Taylor, another Trinity County native, who she met on a backpacking trip for teens in the Trinity Alps Wilderness Area in 1996. Danyel is currently a fiddle instructor and music teacher, artisan of recycled musical instrument accessories and zealous staff member at Ascend Wilderness Experience. 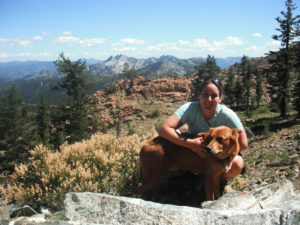 Danyel and her beloved dog Ludwina make use of Trinity County’s curative scenery and trails on an almost daily basis. 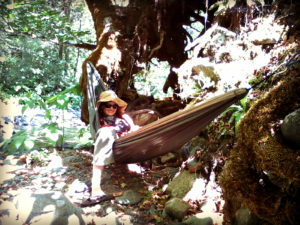 Born and raised in Trinity County, CA, Amanda has always been happiest in nature. She understands how important it is to deepen our relationship to nature and feels blessed to have grown up with the Trinity Alps Wilderness in her back yard. Fueled by a passion to integrate exposure to nature into everyday life, Amanda uses her degree combination of Environmental Sustainability and Cultural Anthropology to explore the social constructions in cultural and community contexts to better understand how we relate to nature and how that shapes who we are and what we do. She spent 6 years as Wilderness Patrol in the Trinity Alps Wilderness and has logged nearly 2,000 miles in the local wilderness. Hiking is one of her ultimate passions. Her unique perspective of addressing environmental exposure and issues via cultural constructions has brought her to work in rural communities in Southern Oregon, the Piedmont of South Carolina, and within the surrounding communities of El Yunque National Forest in Puerto Rico. She also helped found a non-profit called The Zahra Foundation that teaches women in Egypt how to repurpose trash into items of worth in an effort to shift perspectives of how we view our resources on our planet and to boost socioeconomic status while being ecologically minded. Amanda now lives full time in Trinity County, in the home she grew up in, happily contributing her skills and experience she’s gained around the world in her childhood community.